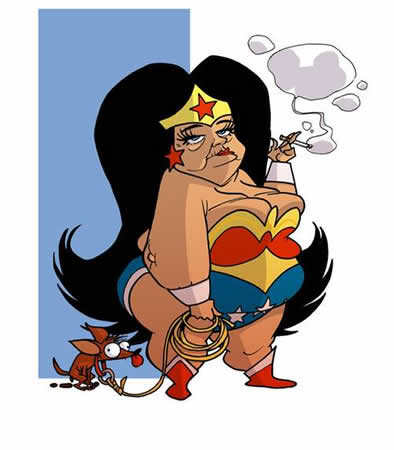 WTF Wednesday – Are YOU Wonder Woman? This is how I feel today. The only thing she needs is her Cabernet. Or vodka. This is my first full year of not buying feminine products on a monthly basis!! Yippeee! BUT – keep those things around. You’re gonna need them at one point or another. If anything-I hear they are great for removing nail polish (this from my teenager….humpfff). I found a Wonder Woman two piece in Florida. There is no such thing as a WW bikini in a size 16 (always remember, in bathing suits you are SUPPOSED to buy 2 sizes up?? Yeah, I thought so). So the hot WW that is me spins around her days quite differently than when I was the hot WW of 14 years ago with a toddler. My main job as WW today is keeping from eating an entire bag of fries from the Mac Steakhouse on a daily basis, staying cool in 100 plus weather, and not killing my teenager or BC. I found waterproof eyeliner the other day (Smashbox) and I think I can now face the word with eyes on! It’s the little things. Looking for the next age spot concealor is a tough job. But someone’s gotta do it..